When do you think this pattern is from? I found this vintage petticoat pattern in an antiques shop in California, but I'm having a little trouble identifying the date. The pattern is numbered 7661, a "ladies' six-gored princess slip or foundation". It's made by the Standard Fashion Company - some internet research tells me that this was a subsidiary of Butterick, in operation from 1888 to 1926. At the bottom of the pattern it says 'Patented October 4, 1887, and September 5, 1889' - I assume that's referring to the company, not the individual pattern. The closest thing I can find online is pattern no. 7241, a very long straight skirt which looks to me like it's from about 1910. The closest dated pattern I can find is no. 5592, which someone has identified as being from 1889. Could my one be from about 1910 too, before skirts started getting shorter? If you've got a better idea, either from your knowledge of underwear history or access to a pattern dating resource, I'd be really interested to know! The sewing instructions are... erm... brief! (And I thought 1950s instructions were bad...) The pattern pieces themselves are in extraordinarily good condition. The markings on the pattern are perforated rather than printed, so at first glance it looks like you're opening some blank pieces of paper. 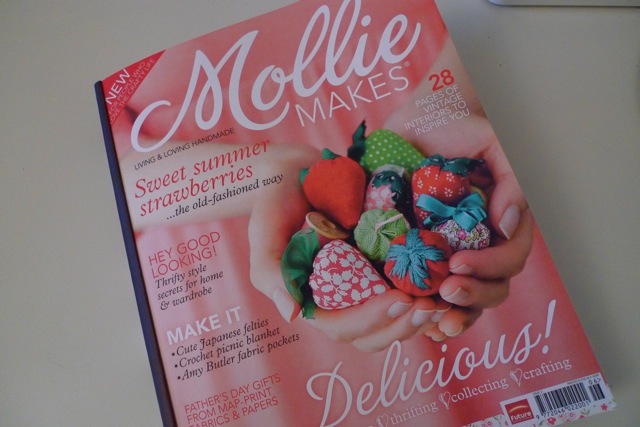 Rather late to the party, on Sunday I stumbled across issue two of Mollie Makes in... erm... Tesco. Proof, if proof be need be*, that the crafting revolution has finally gone mainstream in the UK. The incongruity of the location, coupled with the vision of handmade strawberry pincushions, made me screech in the tropical fruit aisle (I swear they heard it in puddings) and straight into my shopping basket it went. I very rarely buy sewing magazines. To be honest, I rarely even pick them up off the shelf, as the front covers don't appeal. I know some bloggers are fans of Burda, but personally I've never found much in it I've wanted to sew - not that I've flicked through it very often, admittedly. I did buy Sew Hip once and really enjoyed reading it. I felt comforted in the fact that there was a reference to my passion in the physical world, not only online, as it usually staggers IRL people when I tell them that I sew. But while I'm pretty sure I'll buy Sew Hip again, I never made anything from it, and to be honest I find the title a little... embarrassing (ssshh!). Someone gave me a copy of Selvedge once, which was truly beautiful, but so expensive I couldn't justify a subscription. Back to Mollie Makes. First of all, it's just so gorgeous to look at. The cynic in me is whispering that it's all a bit Cath Kidston for my taste, but the rest of me isn't listening... mmm... pretty colours... pretty things... 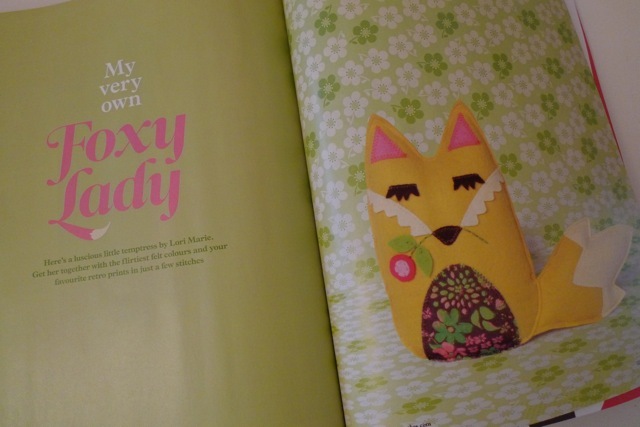 There are some cute, easy projects in it, perfect for Craft Club with friends - such as a strawberry pincushion tutorial, floral embroidery, and an adorable felt fox. I never knew I wanted to make a felt fox! But I do. And I'm definitely going to give the strawberry pincushion a whirl, especially since I spilt earl grey all over my shop-bought one (the tutorial suggests filling it with emery - anyone know where to get this from?). Even if I don't get round to making anything from it, it's lovely to have something as pretty and comforting as this that I can read in the bath or put in my bag for train journeys. I also like finding new fabric shops through the adverts. And it's great to read about crafty people, venues and happenings all over the UK - we're not alone! To the cynic in me, who wonders why I'm enjoying looking at pictures of cupcakes, I'd say that there's nothing wrong with taking aesthetic pleasure in the little things in life. 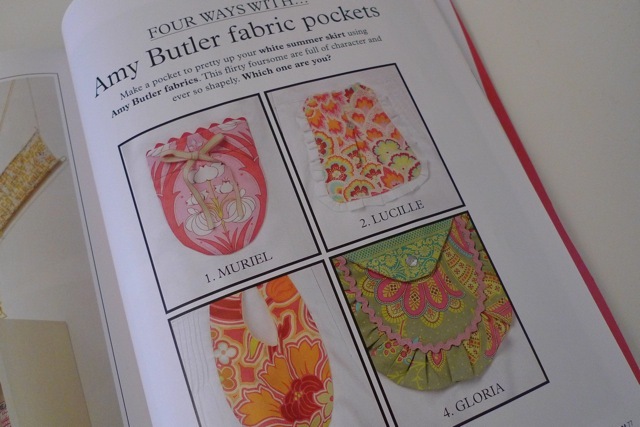 I'm interested to know the value of sewing magazines to people who read sewing blogs. 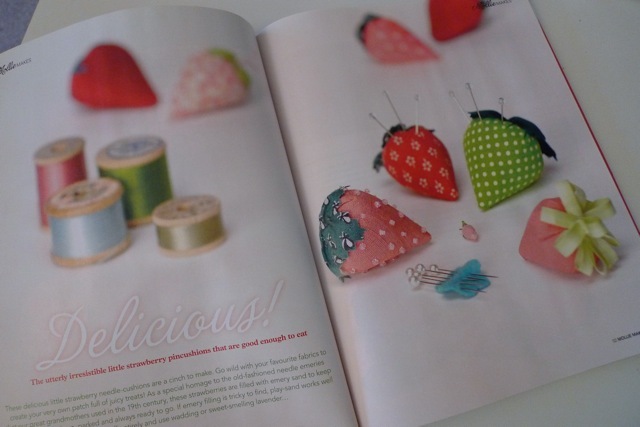 Do you buy sewing or crafting magazines? Why do you read them? Do you make things from them or do you just like looking at the pictures? 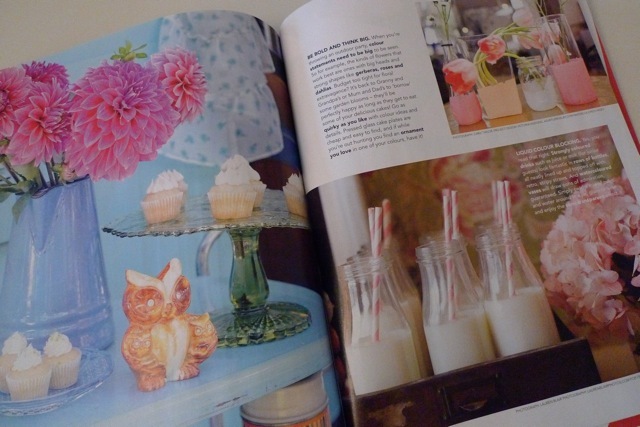 Which other sewing magazines do you think I'd like? I'd love to know! * ten points if you get the reference! To work, followed by curry in Soho with pals. See my ramblings on Day 1. Definitely. This is a particular MMJ rediscovery success. To the office, followed by dinner at my mum's. The sky was dark and the weather dramatic that day (which I love) so I wore this to add a bit of colour to the world (aren't I thoughtful?). To the office, followed by a quiet evening in catching up with emails, phone calls, The Kennedys and embroidery. They're all worn pretty often, as I'm sure you've realised by this stage in MMJ! This question is becoming redundant with certain garments! Sitting at my sewing table (yay!). Oh, and lying on the floor in (yogatic?) positions. A lot. I love this skirt. Right, I'm off to put some more work into my green floral Ceylon. Wondering what I should call the finished dress. Wedding in a Field Dress? Green Tea Dress? Grass Stain Stunner?! Help! Any ideas? Thank you to everyone who entered the giveaway to win gorgeous goodies from Sublime Stitching. Hello from a long time reader. Thanks for hosting such a fun contest. As a crazy cat person (in secret? 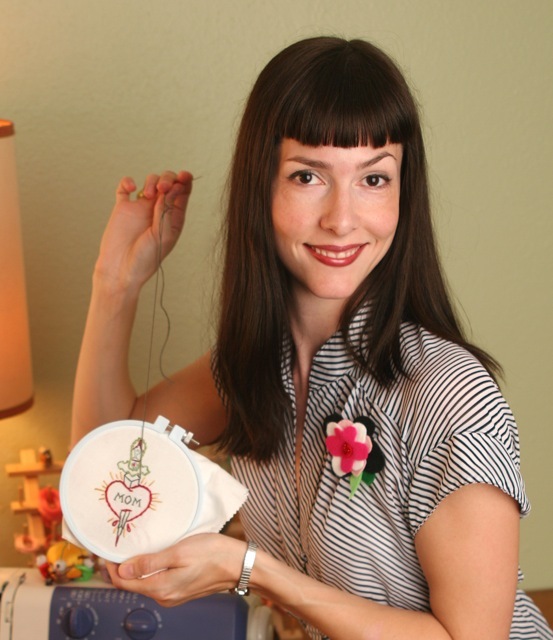 ), I would like to embroider a cute little grey-haired lady surrounded by about 20 cats. Doing all kinds of cat things. Maybe on the bottom of a cardigan? Congratulations Amy from Sew Well! Woooooooooo! Crazy cat lady embroidery! And thank you to Jenny from Sublime Stitching for providing the prize. Do read about how she spends her day if you missed it first time round. Around the house, doing some sewing and paperwork, then out to a birthday bash in the evening. Fairly often. On Day 6, in fact! What's Me-Made it today's outfit? Around the house and on a dash to the shops to see if they had anything I could use as piping on the dress I'm making. A lot, considering it's new. Like Day 3! To my first day back at work after my sabbatical, followed by a working dinner for a project I'm doing. Not very often. The aubergine gabardine is a little conservative for my taste, although it looked less boring with a belt. I made the mint lining a tiny bit too long so it keeps peeking out when I'm sitting down - oops! Oh well, I should consider it a feature. Yes, it probably will now. I quite like it with this top. To work. And in the evening I gave a speech about rediscovering my creative side... and making this dress! As the first garment I made, this dress holds a special place in my heart. I really like the fabric and the simplicity of the shape, and it attracts a lot of compliments every time I wear it. But I don't wear it as often as I could and should. Will it be worn more often from now on? How is everyone else finding Me-Made-June? If you're joining in, are you struggling with the mid-month lull or still feeling motivated to rock your self-made frocks? 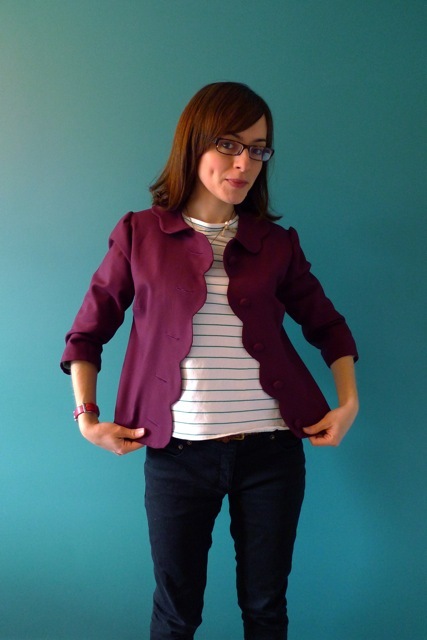 If you're following along, are you inspired to make more of your own clothes? I'd love to know! To enter, just leave a comment here. 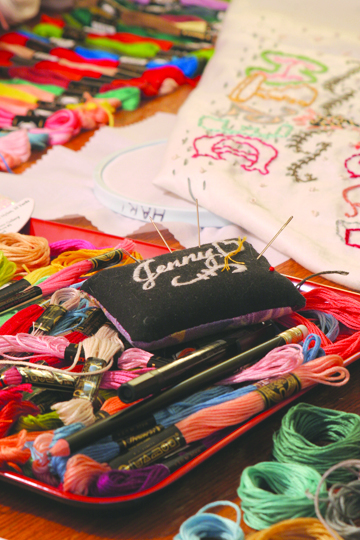 If you could embroider any design of your own creation, what would it be? The deadline to enter is midnight GMT on Thursday 16th June. The winner will be picked at random and notified on Friday. Don't forget to leave your email if it's not linked to your blogging profile so I can let you know if you win. The giveaway is open internationally, with free shipping. 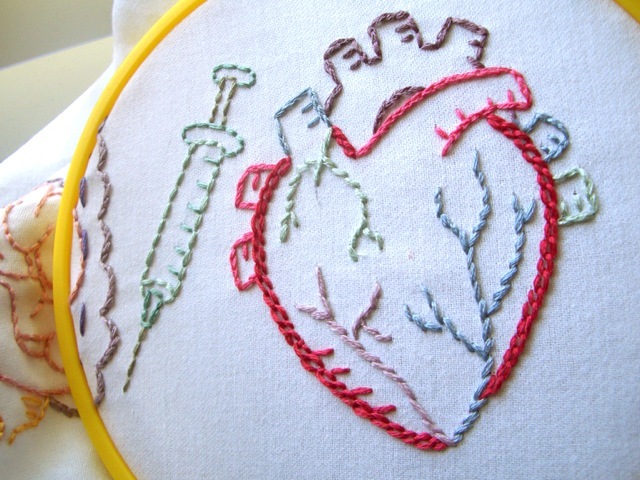 Would you consider yourself a beginner, intermediate or advanced level stitcher? What skills do you think you need to qualify for each level? As you know, I began sewing a year and a half ago, and although I got into the habit of calling myself a beginner, I don't think it was long before I became an intermediate level stitcher, even if I didn't have the confidence to admit it. I hope that doesn't sound arrogant - what I mean is that my approach back then was fearless. I'd throw myself into any technique, without fear of failure. 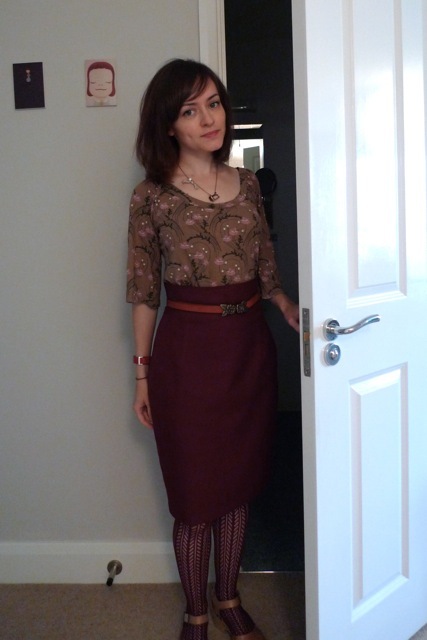 Many people were surprised that my first project was a shift dress, complete with gathered sleeves, zipper, darts and bow embellishments, rather than the classic A-line skirt or pyjama bottoms. I was so overwhelmed with joy at being able to sew something - anything - that I didn't feel I was constrained by any limits. I've realised, however, that after that initial steep learning curve, recently I've been pushing myself less and less to learn new techniques. With little time to dedicate to sewing, if I can take short cuts, I take them, and I'm increasingly avoiding complicated procedures like underlining or vintage patterns that need tracing and grading. I'm not doing anything to become more advanced. 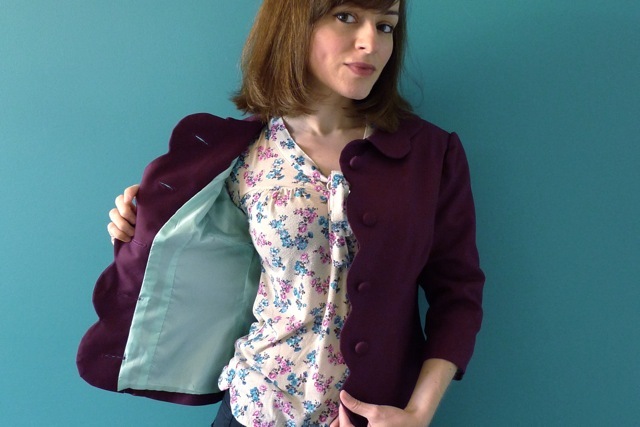 vintage design scalloped jacket with self-drafted lining! Admittedly I've had a lot going on in the rest of my life recently, but sewing is an important aspect of my life that I don't want to neglect. 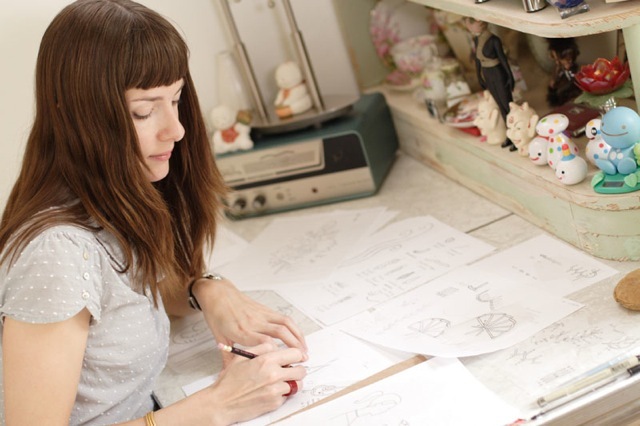 I have such admiration for stitchers like Debi - who started her blog the same time as me and is now making one vintage pattern per week - and Karen - who is in the second term of a weekly intermediate level sewing course. They've inspired me to start pushing myself a little harder again. What else would you consider an intermediate/advanced sewing technique that would be useful to learn? I'm not interested in couture techniques (eg. boning - ouch! ), but skills that I can use in making everday wear. Are there any skills that you're eager to develop next?